This page is dedicated to the history of the AJA. 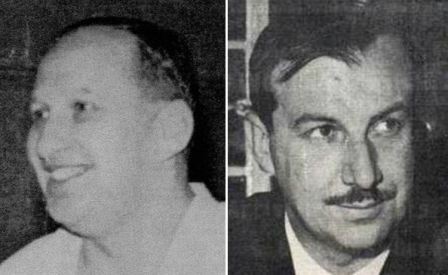 The Amateur Judo Association was founded in 1955 by Harry Ewen (below left) and Pat Butler (below right). Harry Ewen was A.J.A. chairman from 1956 until he was unfortunately killed in a car accident at the age of 43. He founded Leicester Judo club in 1948 and wrote 2 books ‘ Modern Judo and Self Defence’ and ‘Your Book of Judo’. Pat Butler was general secretary from 1956 until Saturday October 14th 1972. During his time the A.J.A. grew from 3 clubs and 150 members to 741 clubs and 40,000 members. Pat Butler later became the President of the B.S.J.A. By 1967 he had written ‘Self Defence Complete,’ ‘Judo Complete,’ Popular Judo,’ ‘Judo for Juniors,’ and ‘Advanced Judo and Self Defence’. This page lists some of the previous officers of the AJA. Unfortunately it is not complete list and we would therefore ask if anyone has information regarding other previous officers please get in touch.